I found an old photo (from last year) of something I haven't blogged about yet. 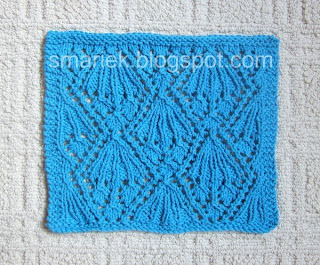 It's just a little wash cloth made from 2 repeats of the Petra Lace Scarf pattern. It knits up on the large size but will shrink back down to a smaller size after washing. I've noticed this with all my cotton washcloths. Or perhaps I'm just very good at shrinking cotton. I've received a nice package from Michele, I need to take photos to show you what she sent me. I would have done it today if we hadn't had a toddler meltdown at daycare drop-off. My cotton cloths also shrink in size after I've washed them. very beautiful, I assume its probably the dryer that shrinks mine, since I only wash in cold water! That's a really nice pattern on the washcloth. I, too, am skilled in the shrinking of cotton, come to think of it, I can shrink ALL fibers. I got skillz. Meanwhile, I have already "opened in another window" the link to the giveaway. Thanks so much for sharing it. 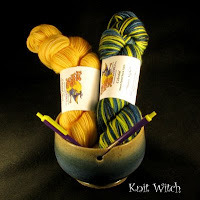 I like the stitch pattern you used in the wash cloth it's very nice. I always love finding little treasures I had forgotten about.